Tucker Hibbert is known across the world for his dominance on a snowmobile but he won’t have to travel far this weekend to showcase his skills. The Pelican Rapids, Minn. resident will be competing at Fargo’s Newman Outdoor Field Friday and Saturday for round two of the AMSOIL Championship Snocross Series(ACSS). For the first time, the FM RedHawks baseball stadium will be transformed into a battlefield for the world’s top snocross racers. Since the Dakota Magic Casino Fargo National is slated to feature a tight racecourse, the holeshot will be key for Hibbert to hold his points lead in the series. Although he won both pro finals at the season opener in Duluth, Minn., he was forced to ride “out of his comfort zone” due to poor starts. With a weekend break on the ACSS Tour, the Monster Energy/Arctic Cat pilot and his crew have put their focus into tuning his machine and polishing his starting procedure. Pro racing action begins Friday evening at Newman Outdoor Field and continues through Saturday afternoon. If you can’t make it to Fargo, stream the event live online at www.isocracing.com and mark your calendar to watch the one-hour VERSUS broadcast Sunday, Dec. 26 at 3 p.m. EST. “I’m pumped about competing so close to home. I guess I’ll have the home field advantage which is a cool feeling. I have a lot of family and friends that will be at the race including the youth group from my home church in Pelican Rapids. I’m going to do my best to make them proud. Thief River Falls, Minn. (Nov. 29, 2010) The Fines Double Racing Team consisting of Reid Rutherford, Tony Valerio, Benn Vernadakis and Agustin Maduena showed the rest of the Class 26 competition that their Arctic Cat 1000 LTD 4×4 had what it takes to win the 2010 Baja 1000. 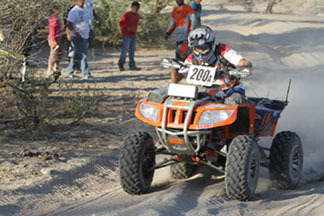 Returning as the defending class champions, the team piloted their big Cat to the finish line with an amazing time of thirty-nine hours and twenty-five minutes through the most adverse of conditions, finishing four hours ahead of second place and several sport ATVs and dirtbikes. For 2010, the race started in Ensenada, Mexico, crossed the Peninsula twice and ended in the southern city of La Paz totaling 1,067 race miles. The terrain is described as primitive at best and ever-changing with silt, rocks, water crossings, heat, snow and outrageous elevation changes. For more information on Fines Double Racing, please visit www.finesdoubleracing.com. For more information on Arctic Cat ATV product, please log on to www.arcticcat.com or visit your local dealer.